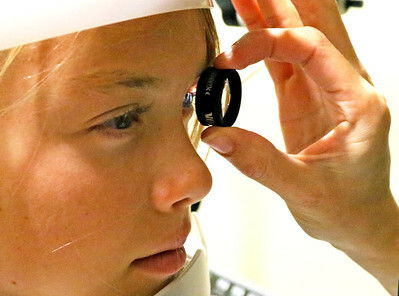 H. Rick Bamman - hbamman@shawmedia.com Optometrist Dr. Rebecca Schoepke examines Alivia Nielsen's eyes on Tuesday, April 3, 2016 at Johnson Eye Care in Cary. Studies shown digital eye strain has become rampant with 65% of people experiencing some symptoms. H. Rick Bamman - hbamman@shawmedia.com Using a retna scope, optometrist Dr. Rebecca Schoepke examines siblings Alivia and Connor Nielsen on on Tuesday, April 3, 2016 at Johnson Eye Care in Cary. 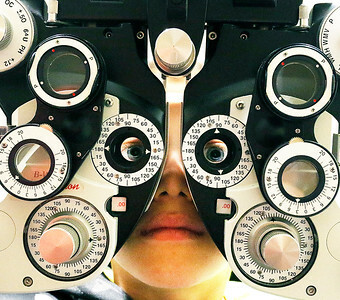 H. Rick Bamman - hbamman@shawmedia.com Connor Nielsen peers through a refractor during an examination by optometrist Dr. Rebecca Schoepke on Tuesday, April 3, 2016 at Johnson Eye Care in Cary. Studies shown digital eye strain has become rampant with 65% of people experiencing some symptoms. 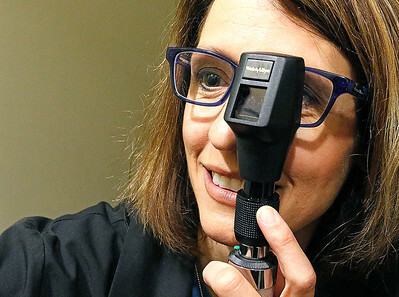 Optometrist Dr. Rebecca Schoepke examines Alivia Nielsen's eyes on Tuesday, April 3, 2016 at Johnson Eye Care in Cary. Studies shown digital eye strain has become rampant with 65% of people experiencing some symptoms.